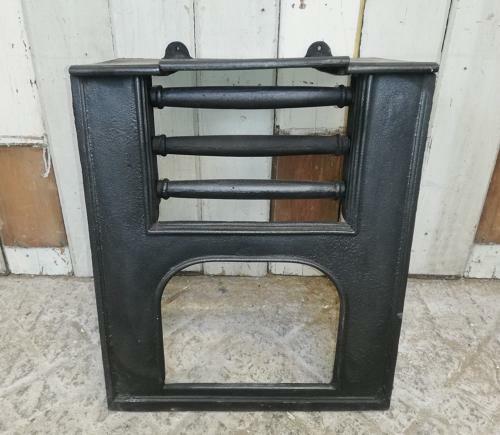 A Victorian, cast iron, hob grate with a simple design. The hob grate is compact in size and has the original front bars and removeable warming plate. The hob grate sits over a fire basket or grill and the top plates were used for warming small pots or bowls. There is a simple border around the front bars and edges. The iron has been blacked and polished and has a nice finish. The fire is antique and has some slight signs of use and wear. The removeable plate does not sit totally flush on the top due to heat. The back has surface rust and there is some slight surface rust to the warming plate and front. There are some slight casting marks and small scratches and knocks. The hob grate has a simple and classic design that would suit a modern or period home and would make a nice interior feature.